Here’s Looking At You is, in essence, an ugly duckling tale. Our heroine Anna returns to school after fifteen years for a reunion. School doesn’t hold happy memories for her, as being a roly poly Italian (known as the Italian Galleon), and always armed with a Tupperware full of pungent Mediterranean food, she was bullied incessantly throughout her years there. Now in her 30s, Anna wants to put the past behind her once and for all and face up to the bullies who made her life hell. But she is much-changed from the girl she once was – all curves and because I’m worth it hair – and no one recognizes her when she arrives. Losing her cool, she backs out on her plan for revenge and slinks off, hoping never to be reminded of her years at school again. 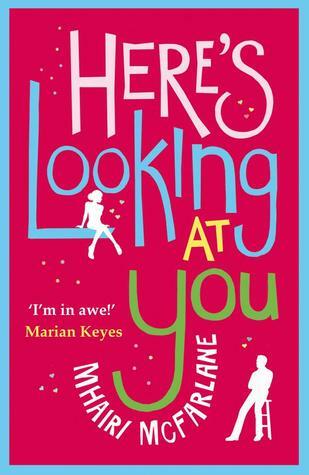 Full of laugh out loud humor, Here’s Looking At You is a novel about facing your demons and being happy with who you really are. After struggling to read the first hundred pages of an angsty teen-sci-fi over the course of a month, I eventually gave in and picked this up instead. I instantly cracked up, the first chapters leaving bursting out fits of laughter earning me strange looks from my co-workers. Worth it, though. It may be a stray from my usual YA outings, but I by no means found it hard to connect with the characters. Anna was easily relatable, and James, by including his perspectives, it added that extra depth to his persona, shaping him into something more than his teen self. Playing out like such a romcom, I could—and would—love to see this hit the big screen. Though, so much happens. I feel like it’d have to be compressed down to fit into a cinematic timeslot. I wasn’t even halfway through the book when I felt like we’d reached what I would have predicted as the end point. I’m glad it wasn’t. It was just so rewarding to go through it all with Anna, her family, and her friends. They came alive so quickly, bonds forming instantly, that it never felt like a chore fitting in that extra chapter before forcing myself to put the book down and get back to work. If I could pimp this book out more, I would. I luckily came across it (mistaken placed) in the YA section at my local Big W, otherwise I probably never would have found it. It was just what I wanted out of a contemporary—it was light and fun, with a slow-burn romance that makes you grin, laugh, and then hit things when Mr Angst comes to town. A hopeless romantic myself, I love these kind of stories that just make you BELIEVE that people are meant to be together. That’s why I’m not heading back to check out Mhairi’s first book, You Had Me At Hello. I found this gave me the same sort of enjoyment that I got out Rainbow Rowell’s adult contemporaries, so if you loved them like I did, head over and check this out.